First of all, I’m pretty sure I haven’t told you that right before I went to Chicago I had lunch with our friend Andrew’s folks while they were in town. It was a real treat. I asked them where they might want to eat and Fred said “Take us somewhere spicy!” What a treat for me to hear that. Plus it was Candy’s birthday. What an honor for me to share a spicy birthday meal with them! Now, big news, our friend Kim has moved back to New York. Shortly after returning from Chicago she invited me to join her for a Mets game . . . aaaand her work had hooked her up with luxury box seats, or whatever they’re called. And guess what: I like watching baseball games this way very much. For me there was definitely a learning curve stepping into this luxury baseball life, but if you gave me a second chance, I know I could really nail it. Also: It turns out the hallway of the luxury box part of the stadium is a lot like the hallway of a nice hospital. Everything is a smidge too carpeted for my tastes. They should make the fancy part of the stadium feel a little more like a stadium. Just a suggestion! One Saturday evening I went down to Brooklyn Bridge Park for Alexis’s 10th New York Anniversary party. Looks like I didn’t really get pictures of anyone except Karrie and Michael! 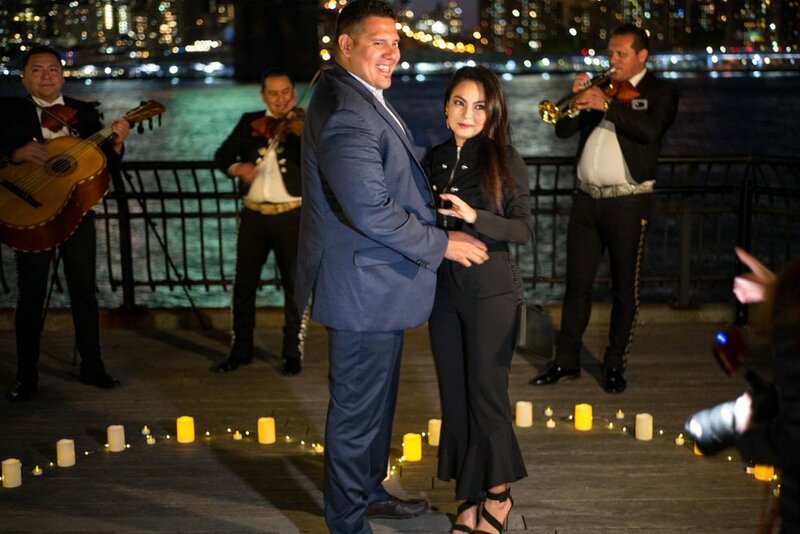 BUT I did get pictures of a surprise engagement con mariachi. Pretty cool! 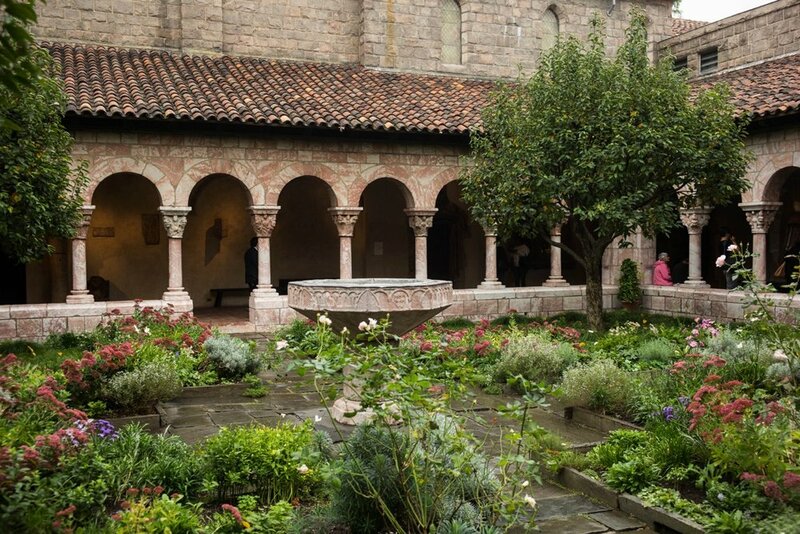 Another Saturday morning I invited friends to meet me at the Cloisters to catch one of the last days of the Heavenly Bodies exhibit. Looks like I didn’t really get any pictures of my friends there except for Tara! (And Cher had even flown out from LA for it). BUT then I had everyone over afters to watch Conference and at least I got a picture of the backs of some of their heads. There also might be photos out there of everyone fallen asleep, but you won’t find those here! 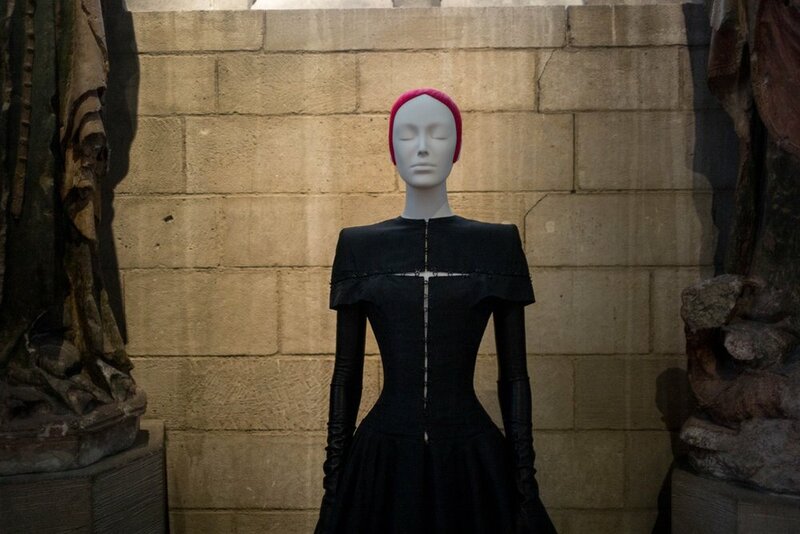 One thing about the religious clothes show in the castle: Eventually I started thinking it was a Dune exhibit. 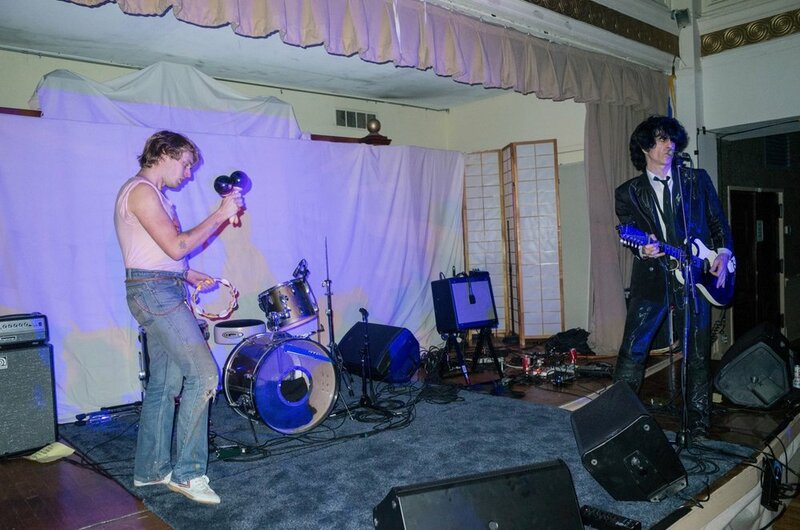 Thanks to the General Women’s Session, that night I was able to go see Ian Svenonius (in the guise of Escape-Ism) and Martin Rev on an upper floor of a great big synagogue (or temple?) 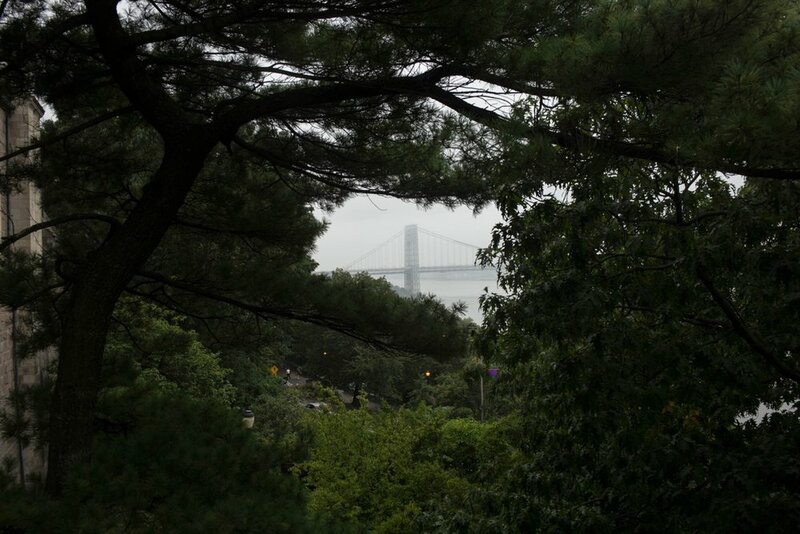 in Brooklyn. It was one of the most New York things I’ve done in a good long while. Another very New York thing: One Sunday I walked through the wrapping-up of the annual Fort Tryon Medieval Festival on my way home from church. I hadn’t been to it in a number of years. I would go again again. In the middle of August I received a group email from my friend Trevor inviting those cc’d to join him in Chicago in September for dinner at Alinea. Long-time Brigham-blog followers may remember when I ate at Alinea, one of the country’s and the world’s best restaurants, in 2016. (Here’s the post about that meal) So when I saw the email I thought “oh that will be fun for the people that go, to eat at Aline and enjoy Chicago”. But after a little bit of thinking I realized that I should be one of those people, and expressed my interest in coming to Trevor. Short story short, a planned table for four at 5:15 turned into a table for six at 9:30, and on the evening of September 22nd, we had quite the dinner. Now, for the sake of total clarity and honesty: We didn’t actually eat at Alinea. We ate at Next, another restaurant run by the Alinea people. 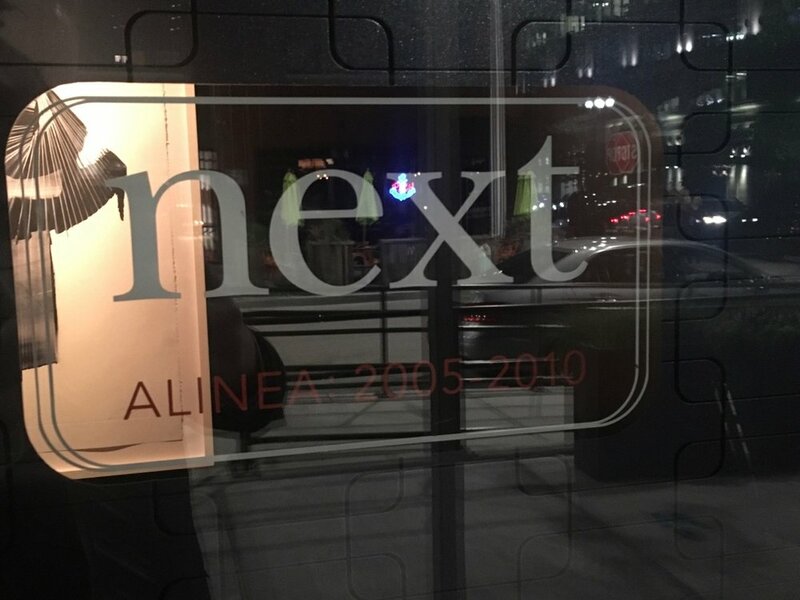 Next serves about 4 completely different themed menus a year and they were serving an extremely well-reviewed retrospective survey of Alinea’s first five years when we went. Look at this nearly ecstatic review from the Tribune! As I ate during Alinea’s second five years, I was looking forward to what we might be served…but I was not expecting to have my socks knocked off. My socks were not knocked off by this meal. My socks were blown clear off. I’ll be up front about it now: there was a point in this meal where, nearly struck dumb by such a succession of transporting and transforming flavors, where I was not only certain that this was the best meal I had ever had, I couldn’t even remember any other meals I had ever had (including Global McDonalds that morning!). Let’s walk through the dishes. Unfortunately and uncharacteristically, I only had my iPhone on me during the dinner, so these pictures…not the best. We came to our table (the chef’s table, in fact! Separated from the kitchen by nothing but a giant window) to find rosemary centerpieces awaiting us. PB&J — a grape (still on the vine!) wrapped in peanut butter and bread. A curious opening bite. Oyster Cream — Oyster cream and caviar with lychee and chervil. A first hint at the deep depths of flavor and spritely taste combinations to come that night. Heart of Palm — Five hearts of palm filled with different fillings, progressing from sweet to savory. A little accident lead me to getting a second sweet-pea hear of palm and a mosquito stuck to my prune heart lead to a speedy replacement. English Peas — An unexpected combination of tofu, ham, and peas served on a deflating pillow inflated with lavender scented air. My second Alinea pillow! Cucumber — a peel of cucumber wrapped around mango fruit leather, a very fancy little bit of fruit by the foot. Skate — around here is where things start taking off. Butter poached skate topped with brown butter crumble and a swirl of flavored powders and salts, here the table began to talk less and drift off with the food more. Hot Potato Cold Potato — the bomb potato dish. I was very excited to see it coming. A purely magical combination of potatoes, butter, and black truffle. The flavor equivalent of splitting the atom. Lamb — Served on a piece of iron heated to 700 degrees, we had been strongly cautioned, repeatedly, not to touch this bar that sizzled like fajitas. I obeyed. Verjus — A palate cleanser featuring a globe of beet that broke beneath my spoon like a yolk, this was a good one. A good one among good ones. Watermelon — Served at the end of a wire tapped with bonito, maybe not a total crowd pleaser. And it turns out I only have a video of the dish. Oh well. Sorry! Tomato — A crowd pleaser! Particularly this crowd of one! A tomato, cut, unrolled, with amazing micro dishes between segments, plus a little balloon of mozzarella there at the end. Loved this. Crab — Bits of crab on a cold little block of coconut cream, also loved. We were deep in the excellence by now. Wild Turbot — served on a, like a savory pana cotta of shellfish flavors in a bowl surrounded by hyacinths, nearly more excellent than I could stand. Beef — Wonderful little piece of A5 wagu served with potatoes and a deconstructed A1 Sauce, both cheeky and a triumphant way to conclude our savory dishes. Orange — “what grows together goes together” the server said, presenting us with a ice creamy combination of oranges and olive oil. Chocolate — An Alex Stupak creation from back when he was the Alinea Pastry Chef and not running fancy Mexican restaurants in New York, it was a block of molten chocolate. You cut off a corner and chocolate came flowing out. Except mine didn’t flow. It was still solid-ish. At least it was extremely chocolatey! So, in conclusion, like I was saying at the beginning: while I ate this meal, it surely seemed like it was the best dinner I had ever had. Now it’s but a dream. I slept in until 10 the next morning with no effort at all. These dishes purely murdered me. Good thing they exist in the past and cannot come back for another revenge.